With a strong international line up of award-winning documentaries from France to Bangladesh, the Stronger than Fiction festival will provoke thought, inspire discussion, and embrace the richness and diversity of different cultures within our city. Co-directors of the festival Simon Weaving and Deborah Kingsland, envisage a bold future for the festival with a vision to transform the event into a national touring documentary film festival, the only one of its kind in Australia. Wouldn’t that be brilliant! Many great business mentors have told me, “Josh it’s all about whom you know… not what you know”. Well I’m lucky enough to know the driving forces behind the upcoming Stronger than Fiction film festival and they’ve given me an exclusive look at one of the award winning films that will be aired during the festival at Palace Cinemas from the 31 July. The film is called Buckskin and it’s a part of a double bill on Sat 2 August. I’m also looking forward to seeing Oscar nominated The Crash Reel which conveniently airs straight after the double bill. I’m also looking forward to the documentary pitching competition, 12 noon on Saturday 2 August, where we get the chance to pitch a documentary in under 60 secs to a panel of judges with the winner taking home $1,000! How good is that? 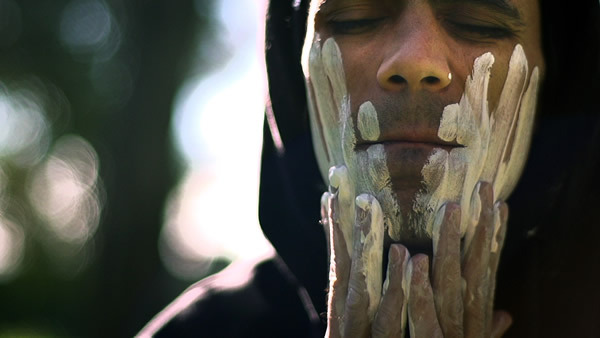 Bucksin is a beautifully cinematic, warm, and intimate documentary that whirls alongside Jack Buckskin’s (Young South Australian of the Year 2011) lifework to revive Kaurna, a once extinct aboriginal language. The film is rich with colour and fluctuates through time with the alluring use of time-lapse and slow motion cutaways to amplify the powerful narrative. Jack grew up in an unfortunate environment of drugs and violence. It was hard for him to find role models when all he witnessed was crime… he nearly thought it was the right thing to do. In 1945, nine years after Western settlement, people were saying that the Kaurna people were extinct. They took away our land, took away our language, and took away our children. Sheep had more rights than the Kaurna tribe’s people. Jack is the sole teacher of the Kaurna language. It proves hard for such a strong young man to take on the role of the elders and pass on this lost language. He says it’s kinda funny that he is light skinned and speaks the traditional language when his cousins who are darker can’t yet. Buckskin is a part of a double bill at the upcoming Stronger than Fiction film festival at Palace Electric cinemas in August. There will be a Q&A with Steven McGregor director of Big Name No Blanket after the screenings that will be hosted by Alex Sloan from ABC666.